Location: Lammermuir Hills, East Lothian, Scotland. 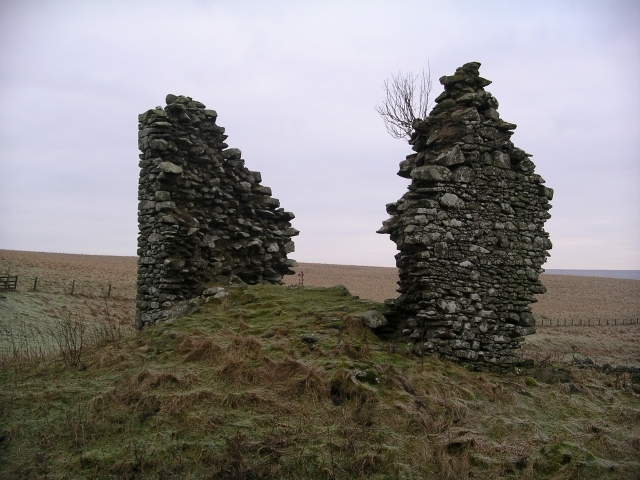 Notes: Gamelshiel Castle is a ruined castle in the Lammermuir Hills, East Lothian, Scotland. It is located at grid reference NT649648, half a mile north-east of the northern end of Whiteadder Reservoir, near to the B6355 road and Whiteadder Water. The castle sits on the south side of the Hall Burn. It is a Scheduled Ancient Monument (No. 5606), and it consists of the remains of a simple tower house from the 14th century. Recent studies indicate that there is evidence of a vaulted cellar. The castle was constructed from Whinstone and the sole remaining north and south walls are 4 feet thick and 20 feet high.